TransMedRi featured on the website of the Delegation of the European Union to the Republic of Croatia, as an example of a successfully implemented FP7 project in Croatia. 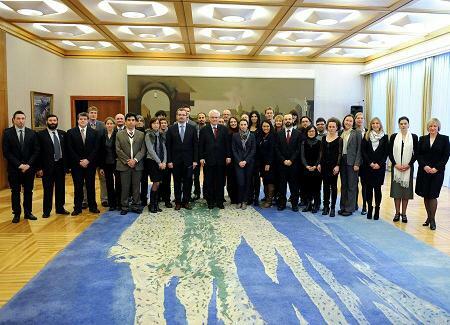 On January 21st 2013, Preisdent of the Republic of Croatia, Dr Ivo Josipović, organized a reception for international scientists currently doing their research work in Croatia. Several of our scientists, employed through the TransMedRi project, participated, including the project coordinator Prof. Bojan Polić. 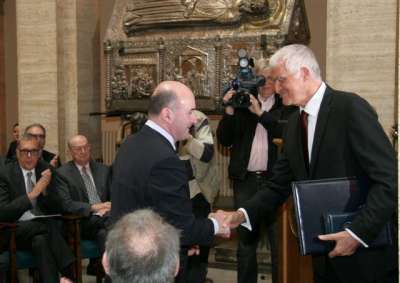 The appointment of Stipan Jonjic as a member of Leopoldina is a remarkable recognition to his scientific achievements in the field of viral immunology. Founded almost 350 years ago, Leopoldina is the oldest academy for medicine and natural sciences in the world. It was appointed the German National Academy of Sciences in 2008. It acts as an independent adviser of public institutions and bodies on scientific issues and encourages the exchange of ideas with foreign researchers and organisations. Approximately three quarters of its members are from German-speaking countries and one quarter from 30 other nations. Stipan Jonjić received his MD from the Faculty of Medicine University of Rijeka, Croatia, in 1976. He made his MSc in the field of immunology of reproduction (1982). After that, he did his PhD thesis in Rijeka and Tuebingen, Germany, working in the field of viral immunology and completing it in 1985. In 1986 he was appointed Assistant Professor at the Faculty of Medicine University of Rijeka and in 1990 he was appointed Associate Professor at the same institution. In 1992 he became Full Professor and since 1996 he has been Head of the Department of Histology and Embryology. In the period from 1999 to 2003 he was Dean of the Faculty of Medicine University of Rijeka. Since 2006 he has been Chair of the newly established Center for Proteomics at the same University. Stipan Jonjic and his group have been investigating the immune control of cytomegalovirus (CMV) infection for over 25 years. The major scientific achievement of his group is the characterization of several mechanisms involved in immunosurveillance of acute and latent murine CMV (MCMV) infection. Working in close collaboration with Professor Ulrich Koszinowski (Germany) his group was the first to show that CD4 T cells are essential for control of horizontal virus spread and can compensate the function of CD8 T cells when these cells are depleted. They also showed that antibodies are not essential for primary CMV control and establishment of latency but are powerful mechanism in preventing the spread of recurrent virus. His group provided the first evidence that immunosurveillance of latent CMV infection is organized in a hierarchical and redundant fashion, with not only CD8T cells but also CD4 T cells and NK cells playing an important role. The group pioneered the work on MCMV evasion of NK cells and characterized several viral proteins involved in downmodulation of NKG2D ligands. More recently, they established the MCMV model of congenital CMV infection of CNS and demonstrated impaired development of cerebellum of infected animals coupled with inflammatory lesions. They have also made a significant contribution to elucidating the recognition of MCMV infected cells by Ly49 NK cell receptors and molecular mechanism involved in specific recognition of infected cells by several activating Ly49 receptors. The group has been the first to show that ‘missing-self’ dependent NK cell activation plays a role in virus control and characterized viral immunoevasion of this effector mechanism. Stipan Jonjic has published over 90 papers in the field of virology and immunology and has been invited lecturer to prestigious international conferences and universities. He has worked as a principal investigator on several national and international scientific projects, including those funded by the European Commission and US National Institutes of Health. His scientific work has been characterized by a long and intense international cooperation. For his scientific achievements he was awarded several national and international prizes. He has been principal advisor to 15 PhD students. Two of his PhD students were awarded the Humboldt fellowship, two of them received the EMBO fellowship, one was awarded HHMI fellowship and one was awarded the ERC Starting Grant. He is currently the Chair of the Department of Histology and Embryology and the Center for Proteomics, at the Faculty of Medicine University of Rijeka, Croatia, and also one of the key people in the TransMedRi project. Prof. Bojan Polić, the TransMedRi project coordinator, is this year's recepient of the annual award for medical sciences of the Croatian Academy of Arts and Sciences. TransMedRi featured in the May 2012 issue of the "Projects" magazine!